Ensembles and individual students from the University of Massachusetts Amherst Department of Music & Dance’s Jazz & African-American Music Studies Program garnered six awards in Downbeat Magazine’s 2017 Student Music Awards (SMA’s). Recognized as the top publication devoted to “Jazz, Blues, and Beyond” since its inception in 1934, Downbeat publishes the SMA winners each year in their June issue. Recordings are submitted from institutions nationwide in a variety of categories and are judged by panels of respected Jazz performers and educators who then pick winners and outstanding performance citations. Besides UMass Amherst, other notable Jazz programs that annually participate in Downbeat’s SMA’s include those from the University of Miami, Manhattan School of Music, Berklee School of Music, Eastman School of Music, and University of North Texas. “These awards are extremely prestigious, and are selected through a highly competitive process. The fact that our students were able to amass six this year is all the more impressive” said Professor Jeffrey W. Holmes, director of Jazz & African-American Music Studies and of Jazz Ensemble I, chosen as this year’s Collegiate Winner of the Blues/Pop/Rock Ensemble (Graduate) category. The UMass Vocal Jazz Ensemble (pictured above), directed by Professor Catherine Jensen-Hole, was the Collegiate Winner of the Latin Ensemble (Undergraduate) category. In addition, soloists Christian Tremblay (keyboards MM ‘16), Mike Caudill (tenor sax and EWI MM '16) and Dann Friedman (tenor sax MM ’18) all received Outstanding Performance recognition in the Blues/Pop/Rock Soloist (Graduate) category, and Mike Caudill also received an Outstanding Performance in the collegiate Jazz Arrangement category for his vocal setting of “Scarborough Fair” (which coincidentally was performed by the Vocal Jazz Ensemble). The June issue of Downbeat also includes a sidebar article with Mike Caudill’s comments on the Jazz Ensemble’s win in the Blues/Pop/Rock category. This year's winners also included UMass Amherst alumnus Lucas Apostoleris ('15), now a master's candidate at the University of Miami's Frost School of Music, who won awards in the Original Composition Small Ensemble and Jazz Arrangement categories. 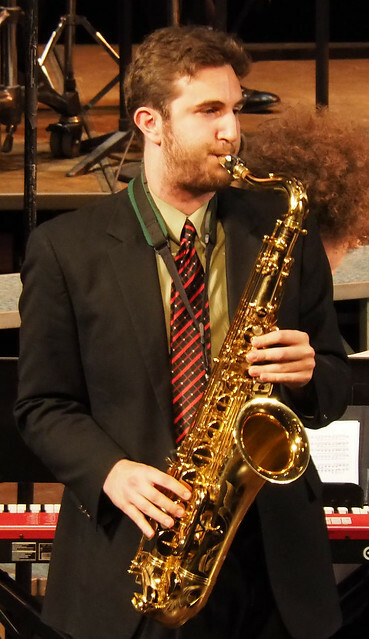 To date, students and ensembles affiliated with the Jazz program at UMass Amherst have won 50 Downbeat Student Music Awards since Jazz Ensemble I first won the Best Collegiate Jazz Ensemble category back in 1987. “Both Jazz Ensemble I and Vocal Jazz Ensemble have won their respective Jazz categories in years past, and our students and ensembles have also done so in Jazz Composition for large and small ensembles, Jazz Instrumental Soloist, Jazz Vocal Soloist, Studio Orchestra, and Jazz Combo. This speaks to the breadth of music interests covered by our program,” said Holmes.